A new report tries to stifle Democrats' confidence that demographics guarantee the party's electoral success. But it's not totally persuasive. 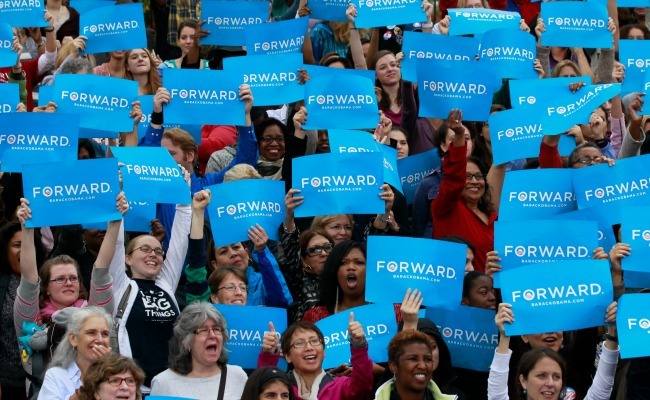 To hear some Democrats tell it, the bold, progressive future is on the horizon. It's a matter of simple demographics: The segments of the electorate that are growing -- young people and minorities -- all overwhelmingly favor Democrats, while those that favor Republicans -- older voters and whites -- are declining. The "rising" electorate doesn't just like President Obama, either; its members evince broadly progressive attitudes, from a weariness with divisive social issues to an earnest belief in government's ability to do good. Add it up, and you have an unstoppable recipe for victory for populist pols in the mold of Elizabeth Warren and Bill de Blasio. After all, if the 1980 electorate (88 percent white) had had the same makeup as that of 2012 (72 percent white), with all the racial and ethnic groups voting in the same proportions, Ronald Reagan would have never been elected president. A new study released by the center-left think tank Third Way on Friday aims to pour some needed cold water on liberals' excited claims. Not so fast, says researcher Michelle Diggles, a Ph.D. political scientist. "Faith that demographics will deliver Democrats to power over the next several decades rests on ... illusions about voters and their beliefs and behaviors, for which there is conflicting evidence," Diggles writes. Rather than assume a mandate for untrammeled liberalism, "Democrats must resist complacency and develop an accurate understanding of the new electorate." After crunching data from more than 40 public surveys and exit polls, Diggles concluded that the "demography-is-destiny" Democrats are engaged in wishful thinking. 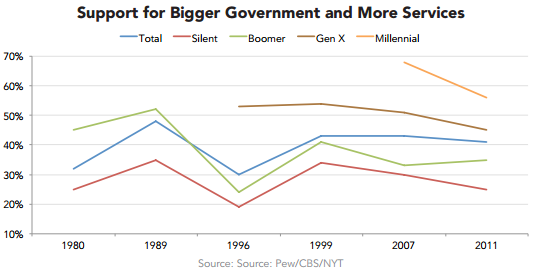 The Millennial generation, she writes, is not overwhelmingly liberal or overwhelmingly pro-big-government; its ideology and Democratic loyalty are subject to change over time. Similarly, Asian and Hispanic voters aren't necessarily party-loyal, and their views fluctuate widely between immigrant generations. Views on gay marriage appear to have shifted for good, but that can't be said of other social issues -- particularly abortion, an issue on which views have remained stable over time across demographic cohorts. And the broad, national demographic trends don't apply evenly across all the swing states. "Just because these people have voted for Obama twice by historic margins doesn't mean they're necessarily liberals, nor does it necessarily mean they're going to be permanent Democratic voters," Diggles told me in an interview. 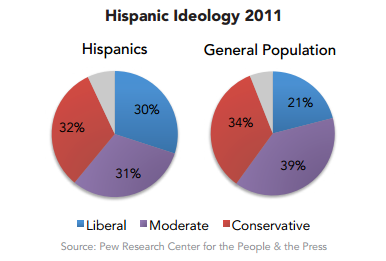 "Look at ideology: Hispanics are evenly divided between [those who call themselves] conservative, moderate, and liberal. 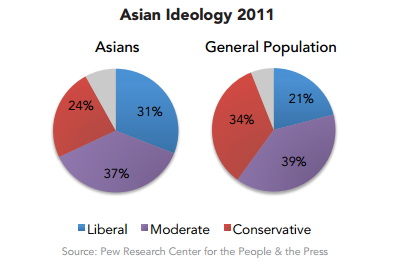 Among Asian-Americans, the plurality, 37 percent, is moderate, though they do tilt liberal compared to the general population." Diggles' report, which you can read in full on Third Way's website, makes good arguments, and is a useful corrective to some of the more outlandish predictions of confident progressives. While Republicans' fight over how to steer their party back to victory has been raw and public, the old Democratic fight between the Clintonite moderates and old-school liberals has yet to be revived for the 2016 primaries. It's always important to remember how quickly things can change in politics, and how mammoth an effect small changes in the electorate can have -- just look at the difference between 2010, when 77 percent of the electorate was white, and 2012, when just 72 percent was. Look at the Millennial line arcing below or above the other generations; look at the 10 points or so by which all these groups call themselves more liberal than the population as a whole. Even if these groups' faith in government and Democrats erodes, it will still be higher than the rest of the electorate, and as long as these groups continue to claim larger shares of the vote, they'll continue to drag the electorate in their direction. The No. 1 predictor of how people will vote, even as they age or their ideology changes, is what party they belong to or have voted for in the past. I've written before about this phenomenon, which decades of political-science research supports. Diggles argues that people are now less "brand-loyal" than they used to be, a phenomenon that plagues both marketers and political parties alike. This idea -- that the nature of partisanship in America has changed -- is interesting but unprovable; we can't know until it happens that this generation will behave in ways unlike the ones that came before. It's an interesting argument, but it's based on rhetoric, not data. Overall, Americans are far more likely to identify as conservative or moderate than liberal. In recent years, Republicans have become the party of conservatives, while Democrats comprise a liberal minority and a moderate majority. That means Democrats can't win by being a purely liberal party; if they alienate voters who see themselves as centrists, they'll lose. But at the moment, for reasons of demographics and ideology both, it's Republicans for whom tacking to the center poses the bigger challenge.